When it comes to garage door repair services, Pros On Call can’t be beaten. Call our licensed experts for all of your garage door opener troubles including garage door engine repair. We perform garage door motor repair, replacement, installation, and maintenance services to keep your garage door working properly at all times. Get in touch with us to learn more! Issues with garage doors can be frustrating, especially when you can’t get the door to open. There are a number of factors that can contribute to this problem from faulty springs to a blown garage door engine. PLEASE NOTE: It is important to remember that trying to get back in yourself can wind up resulting in much more costly repairs than calling a professional garage door service. It can also lead to personal injury or worse. Don’t take unnecessary risks. Seek the help of our qualified garage door repair specialist first. 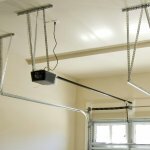 Why Pros On Call For Your Garage Door Opener Motor Repairs? Our licensed, bonded technicians have a minimum of five years’ experience installing and servicing a wide range of garage door systems. We can handle any garage door repair or replacement project, including preventive adjustments and maintenance that will help keep your garage door and garage door engine functioning well for years to come. Whether the issue revolves around a simple lockout or remote control malfunction or if there are more serious repairs necessary, we can help you get back into your garage and solve the problem that was keeping you out, often in one visit and at a low cost. If we discover a larger issue, we can work with you to solve the problem quickly and affordably. We are a full-service security solutions company with decades of combined experience among our expert service team. We offer timely and affordable repair services either on an on-call, emergency basis or by appointment. Is a broken garage door motor, worn rollers, or bad tracks keeping you from getting into your garage? Just call us! Sometimes replacing a blown garage door opener motor (or other components) can be more costly than replacing the entire system at once. We will fully assess the situation and give you our best advice on how to proceed. If you have a lockout or malfunction emergency, Pros On Call provides fast, reliable lockout assistance as well as emergency garage door opener repair. We strive to respond to all calls as quickly as possible and can perform many routine services and repairs on the spot. A properly maintained garage door can serve you trouble-free for years, but many homeowners still neglect their optimal upkeep. We can assess the construction, durability, and functionality of your garage door and make recommendations about a proper garage door maintenance routine to keep it working optimally for the foreseeable future. We work with and install all the top garage door brands including Amarr, Liftmaster, Udt, Denco, and Perma-Door. No matter what your needs may be, we can offer you quality materials and service at rates that fit well into your budget. Need help with any garage door or locksmith-related issue? Call right to learn more about garage door openers or to request our garage door engine repair solutions. Garage Door Engine https://prosoncall.com/garage-doors/repair/opener-engine/ 4.0/5 based upon 25 reviews.